The federal transportation regulator has ruled that Omnitrax Canada abdicated its responsibility to repair the railway to the northern port of Churchill, Man., and must resume operation of the tracks "as expeditiously as possible." The Canadian Transportation Agency ordered Omnitrax to begin repairs on the Hudson Bay Railway by July 3 and file monthly progress reports beginning in August until the work is complete. 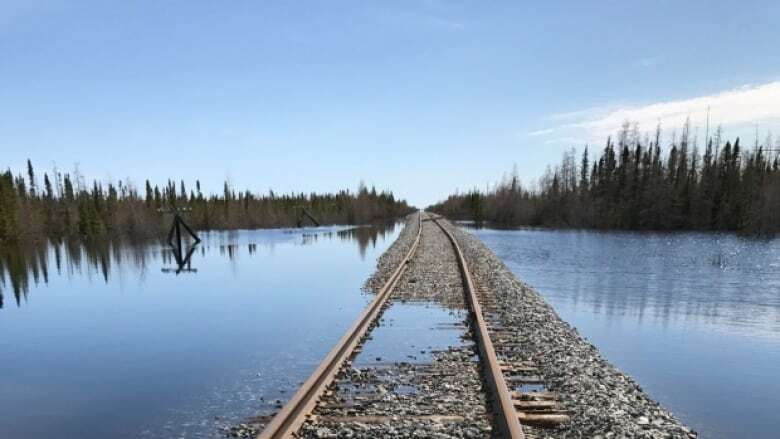 The railway is the only land link between the south and Churchill and other remote northern communities, where prices have soared as goods have had to be flown in. The Wednesday ruling came after a complaint was lodged by the provincial New Democratic Party last year. A copy of the agency's findings was sent to CBC News late Thursday. The regulator determined that Omnitrax has a public duty to restore service and was not entitled to more than a "reasonable pause" of operation because of the unforeseen flooding that closed the track in spring 2017. The Canadian Transportation Agency says the Denver-based company should have taken reasonable steps to repair the line by November 2017 — the admittedly "ambitious" timeline first proposed by the engineering company, AECOM, that Omnitrax hired to assess the damage. The regulator said Omnitrax would only have been relieved of its repair duties if it had followed the federal discontinuance process in advance. In its justification, the transportation agency considered a 2017 ruling that found Canadian Pacific Railway could not be permanently relieved of its duty to provide rail service after a 2014 fire damaged the Marpole Bridge bridge near Vancouver. The railway company chose not to repair the bridge because of high costs. Omnitrax can file an appeal of this week's verdict within 30 days if the company wants to contest the ruling. The company expects to announce its position early next week, an official said. Omnitrax officials have adamantly refused to repair the tracks, saying the company can't afford the cost — estimated between $40 million and $60 million — and that the transportation lifeline should be treated as a public utility since the railway line is no longer commercially viable. They claimed the flood was a "force majeure" event, an exceptional circumstance that curtails the firm's contractual obligations. The Canadian Transportation Agency, however, dismissed the NDP's request that Omnitrax establish a $3-million compensation fund for the community, citing a lack of evidence. Omnitrax had wanted the NDP's application to the transportation agency to be tossed on a number of grounds, and argued the political party lacks standing to complain about the lack of rail service to Churchill. The provincial government initially didn't support the NDP's application, describing the complaint as a form of "grandstanding" and "preening in front of the media." NDP Leader Wab Kinew said the provincial government, with its many employees and resources, should have demanded action. "They threw up their hands. They said there's nothing that we can do," he said. "We stood up for the people of Churchill." The regulator's decision may be moot, however, because Omnitrax has reached an agreement in principle to sell the railway, along with the Port of Churchill, to a consortium of northern communities. The deal, which would leave the new owners with the responsibility for repairs, is expected to be finalized next month. But if Omnitrax does not relinquish the asset in time, its appeal would reach a federal court that may decide to award financial damages to the community, Kinew said. He invited the provincial government to help, especially if a legal battle results. Asked if his party would continue in the face of potential legal costs, Kinew said, "We're going to continue standing up and following this through to conclusion." The provincial government declined Friday to comment and instead directed queries to the federal government, since railways are a federal responsibility. Transport Canada said it has long held the view that Omnitrax is obligated to repair the line. Churchill Mayor Mike Spence told CBC Manitoba's Radio Noon on Friday that the regulator's decision doesn't affect the consortium's plans to buy the railway back. "Once we get that done, it's on to prosperity."